It’s common to be curious about how your power output or FTP compares with other people, or to wonder what counts as “normal”. This post should answer some of those questions based on data from thousands of people who have used Cycling Analytics. In this post, we’ll look at what people say their FTP is, and then look at the best efforts that people have actually achieved for a handful of durations. All data is shown for males and females in watts and watts per kilogram. Be prepared to see a lot of charts and tables and numbers. It’s worth saying a few words about Cycling Analytics users, because they aren’t a perfectly random sampling of cyclists or people overall. The best term that I can think of is that Cycling Analytics users are “serious cyclists”. All the data here comes from people with power meters, and about half of Cycling Analytics users race regularly. Firstly, let’s look at what people say their FTP is. FTP, or functional threshold power, is nominally the power output that can be sustained for one hour. All the data below and more is shown to Cycling Analytics users in interactive charts on the athlete statistics page, so consider creating an account if this is interesting. Just like 5‘11” males on dating sites, it looks like a lot of guys don’t want to admit that they have an FTP of 190W or 290W when it could be 200W or 300W instead. 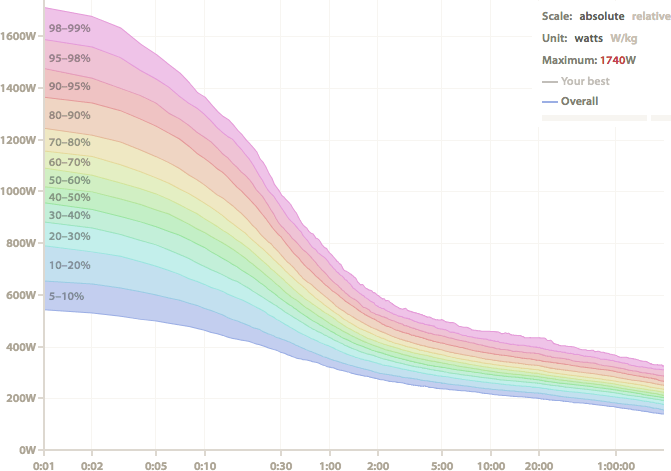 There’s also a spike at 250W because it’s a nice round number that’s very close to the average FTP. % of people have an FTP below W.
% of people have an FTP of W or more. % of people have an FTP between W and W.
This data is smoother because the peaks caused by the round numbers in reported FTP and weight smooth each other out. % of people have an FTP below W/kg. % of people have an FTP of W/kg or more. % of people have an FTP between W/kg and W/kg. Like with the men, not many women say they have a 190W FTP when it could be 200W instead. There is less resolution for this data because there are a lot more males than females that use Cycling Analytics. It’s one thing to say you have an impressive FTP, but it’s something else to demonstrate it, so let’s now look at the best power outputs that Cycling Analytics users have sustained for various durations. Cycling Analytics users can see all this data for all times between one second and two hours with a chart like the one below, and a few more things, so create an account if you want to see more. It’s important to keep in mind that this data represents what people have actually done, and because most people haven’t attempted a maximal effort at all durations, these numbers are lower than the true potential maximums of the population it represents. This is probably especially true for the lower percentile levels. In addition to the best efforts for five seconds, one minute, five minutes and twenty minutes, 95% of the twenty minute best effort is shown because it’s a common estimate for FTP. Each row represents what somebody at the nth percentile level has achieved, so the top row indicates that 99% of people have lower numbers than these, or that 1% of people have higher numbers than these. There is a lot more variation at the extremes. There are similar jumps in power between the 80th and 90th percentile, the 90th and 95th, the 95th and 98th, and the 98th and 99th, despite the declining number of people in each of those groups. There are a lot more males than females using Cycling Analytics, so the top percentile listed here is the 95th. This table shows the difference between the numbers for males and females at equivalent percentile ranks relative to the female numbers, so “15%” means the male number is 15% higher. Keep in mind that these numbers are based on the people who use Cycling Analytics, and aren’t necessarily representative of the broader cycling community or people overall. Overall, males have higher absolute power outputs, but this gap is narrowed when taking weight into consideration, when looking at longer efforts, and when looking at higher percentile levels. Notably, the median (50th percentile) twenty minute effort in watts per kilogram for males and females is exactly the same at 3.80W/kg, which means the average male and female Cycling Analytics user should be able to ride up a mountain at about the same speed. 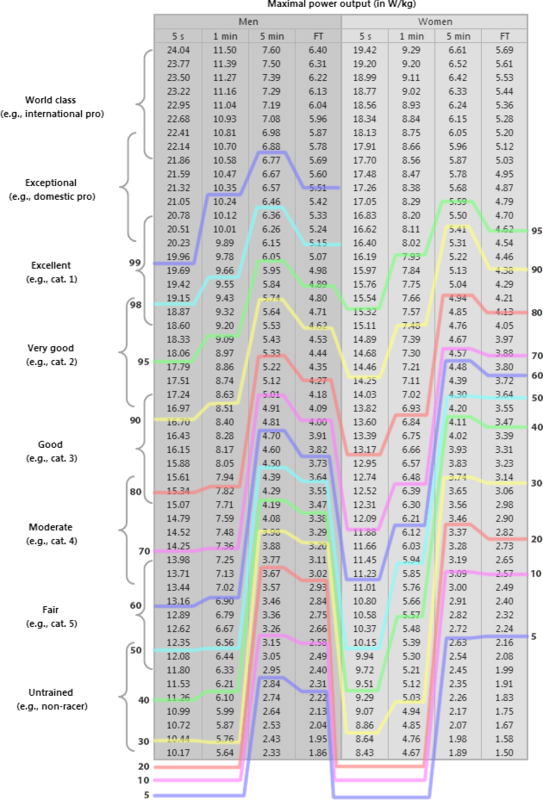 Andrew Coggan put together a widely used table of power outputs in watts per kilogram that males and females, from world class to untrained and everywhere in between, are typically able to achieve for five seconds, one minute, five minutes, and at FTP. What follows is this table overlaid with coloured lines representing each percentile level shown in the above tables. 95% of the twenty minute best effort is used for the FTP. The five minute and FTP numbers are always better than the five second and one minute numbers. This might be because the chart was designed for all types of cyclists, including track cyclists, whereas Cycling Analytics users are generally road cyclists. People in the bottom 20% don’t make it onto the table for five second and one second efforts. This might be because a number of people haven’t uploaded rides where they have pushed themselves hard enough for these short durations. Or maybe the table overstates what is typically achieved at these levels. Female Cycling Analytics users at a given percentile level are consistently on a higher level than the males. There you go. I’m not sure how to finish this other than by saying that I hope you found this informative.